Wow! That’s a 75% reduction in local loan originators! As a longstanding member of said workforce, I have seen it all and I can honestly say I’m not surprised. Looking at the chart that accompanies the article, it seems that greed had been on the rise for quite some time. 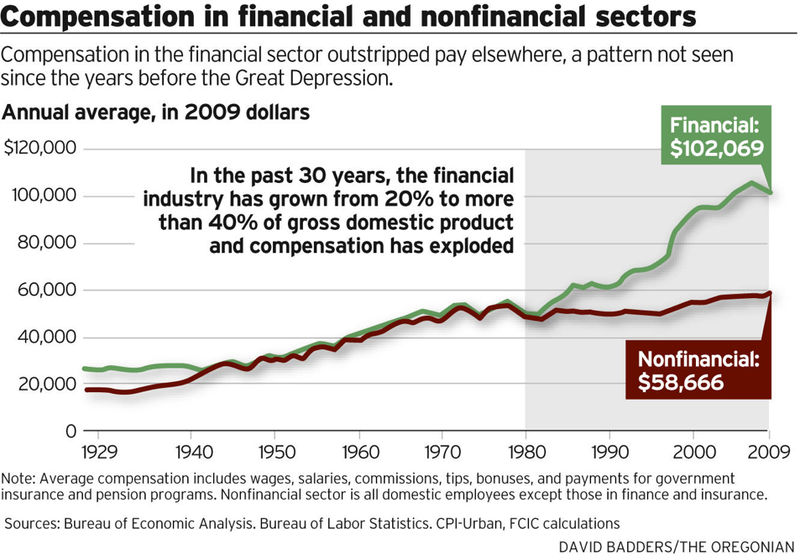 Compensation in the financial industry doubled as a percentage of the gross domestic product, growing from 20% in 1980 to more than 40% right before the big crash. As Americans accumulated paper wealth, nobody got fatter than the financiers, a warning sign that echoed the pattern seen before the Great Depression. The good news, at least locally, is that the financial bust weeded-out most of the incompetent and crooked lenders out there. Tougher regulations, while making it more difficult to process and underwrite a loan, have eliminated the products, systems and players that got us into trouble. Those of us left standing have got to be here because we want to be and because we truly understand the process. Sanity and right-sized paychecks go hand-in-hand. Whether you’re a first-time homebuyer or a veteran ready to once again brave the real estate market, take advantage of this new day in the local financial world. There has never been a better time to ask questions, get information or find a loan officer who has a job because they actually know what they’re doing and want to help.